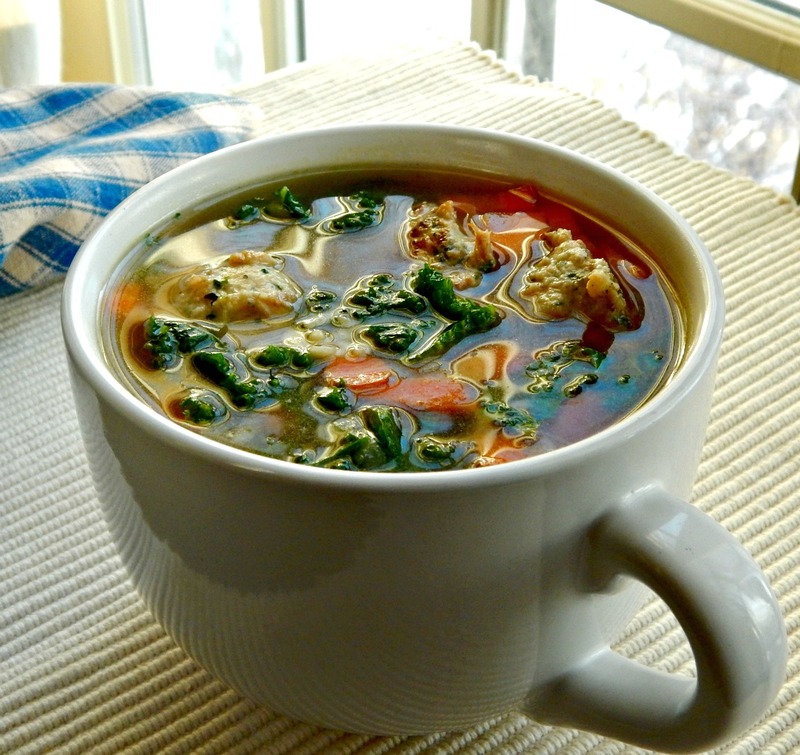 This Healthy Italian Wedding Soup is a huge fave at my house. The tender meatballs, made from chicken and flavored with old world spicing and a touch of ricotta just “make” this soup. They just nestled right into the rich broth brimming with hearty vegetables. It is so delicious, no one will notice how healthy it is! I was surprised to learn that Italian Wedding Soup is actually a Minestrone. The name comes not from being served at weddings but because the soup is a marriage of flavors. And once you have a great meatball for the soup, the rest is gravy. ahem, the rest is soup? Honestly, when you look at the ingredients to this Healthy Italian Wedding Soup, you might think it looks a little mundane. Just because it is so easy and the ingredients are simple. Don’t be fooled, though, because if you use a good broth or stock, add those meatballs in and the touch of wine, this soup is incredible. It’s one of my favorites of all the different Soup Recipes on my site. You’ll want to use a good broth, preferably home-made, as the broth is a huge part of the flavor of the Healthy Italian Wedding Soup. Then you’ll fill the soup out with the meatballs, healthy veggies and just a touch of small pasta. We really like orzo the best, I think it swells less in the soup, but you can use any of the tiny pasta shapes. If you want to, a can or about 1 1/2 cups of white beans can make your Italian Wedding Soup a little heartier and stretch the soup just a bit. If you do decide to add the beans, rinse them well. You’ll use about 1/2 recipe of the Chicken (or Turkey) Ricotta Meatballs in this soup. You can cut the recipe in half or make the full recipe and use the rest for something else. Then there are two ways the meatballs can be added to the soup. They can be tossed in raw to simmer or they can be baked and browned and added to the soup just to heat through. If you choose to bake and saute before adding to the soup, deglaze the pan and add that to the soup, too. It’s like extra bonus flavor. I’ll give you directions for both methods. The meatballs are really the majority of the cost of the soup, so shop well for those ingredients. Other than that, the stock is the next thing that will really set you back. Homemade is so much more inexpensive and if you can get in the habit of making your own with bones and scraps you’re that much more ahead. Look for sales on boxed broth, and stock up especially around the Winter Holidays when it’s bound to be at a low. Most of the veggies are inexpensive; carrots are usually cheaper in the larger bags. Watch for onions on sale and check the various types, different sized bags, and differently sized onions as well as the loose onions. Usually, you want the cheapest per pound. I don’t usually see kale on special but Swiss Chard can be used if kale isn’t available. Orzo is one pasta that is never included in the sales at my grocery store. And it’s not one of the cheapest kind of pasta although a little goes a long way. Feel free to substitute, but know many kinds of pasta will swell up in the soup, then you’ll want to add more stock. Italian Wedding Soup with Chicken & Ricotta Meatballs. The meatballs may be baked as directed in the recipe, the pan deglazed with the wine and/or broth and both the meatballs and the deglazing liquid can be added to the soup: the deglazed wine/broth is added when the mixture is brought to a boil and the meatballs added along with the pasta. Alternatively, the meatballs may be added in a raw state once the broth and wine are brought to a boil. Turn the soup down to a brisk simmer and add the meatballs. Simmer for a total of 10 to 12 minutes. That means you’ll add the meatballs to the simmering broth, and give the meatballs a five to six-minute head start before adding the pasta. Add olive oil to Dutch oven, heat to medium and add onion, carrots, and celery and cook until nearly tender, about 8 to 10 minutes. Add stock and wine (or stock, wine, and drippings if your meatballs are already cooked) and bring to a simmer. If using cooked meatballs, simmer the broth for about five minutes and then continue with the recipe. If cooking meatballs from the raw state in the soup, add them as soon as the soup comes to a simmer. Once added, return the pot to a simmer & cook for about five to six minutes. Then continue with the recipe. To continue with the recipe, add pasta (and if using cooked meatballs, add the meatballs, too) and simmer an additional five to seven minutes until pasta is nearly tender. Add kale and cook for a moment or two until wilted but still fresh and pasta is done to your likeness. This entry was posted in Click here for Bargain Meals, Click here for Fabulous Food Posts and tagged Bargain Meal of the Week, Chicken, Chicken Stock, Kale, Pasta, Soup, Turkey. Bookmark the permalink. Can’t wait to try these chicken and ricotta meatballs! So heart warming is this soup! Healthy Eats perfection! Janice, you’ll LOVE those meatballs – they’re a game changer! This sounds like a wonderful soup, and I love the look of those chicken meatballs! I will get my fill of meatballs! This is one of my favourite soups but I’ve never made it because of having to make those tiny little meatballs. Your version sounds much easier and delicious. Thanks so much! The scoops with the sweeps are so fantastic and make this so easy! That and the baking. I’ve only got one of the larger ice cream scoops but keep thinking I should buy a couple smaller ones for making cookies, fruit balls or something like this. I am surprised at how often I use the small 1 tablespoon one. I use it, too, when I make potstickers! Love italian wedding soup. Looks absolutely delicious. I’ve never made it before , my bad! Lol that must be rectified. Hey, do I have a recipe for you, then! LOL!